Some doodling in Zbrush, I didn't know what to do really ha-ha, but in the end I just went for something that looks abit like Crysis/Apple Seed-ish. Great work on this, so professional! Do you think it is possible that I could find a basic mech template on Z brush to start with? I have seen a few but not like this, your work is gorgeous. THE LINK YOU PROVIDED KEEPS SAYING THE VIDEO IS NO LONGER PROVIDED. DO YOU THINK YOU CAN UPLOAD IT AGIAN? Yes i will upload again. Wow!Great creation and cool style! well one! keep it going! Fantastic ! is it rendered in Zbrush ? Yes and then i complied it up in Photoshop. Fantastic work, love seeing Zbrush creations and this one is no exception thanks so much for sharing!! It looks stunning! The shading is so amazing! My pleasure! Keep it up! Nice detailwork and interesting textures. I'm particularly a fan of how you worked its face. 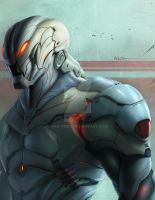 wow very good.. looks an alien/fallout/crysis/matrix sentinel character! hahah nice!! Also has a touch of Prothean/Collector from Mass Effect. Really awesome! Not really, I pretty much rendered it a few times with different materials applied to him, and then complied them up in Photoshop. Well, good materials there, and yep bit of photoshop is usefull. Zbrush is very quick at rendering as it only takes seconds even with a mid range pc. seen the video, did you texture it too on that software?